Sunday, September 1st had the best weather of the Labor Day weekend so I made it a point to get out on the water. I started at Wilson’s Landing and headed north. 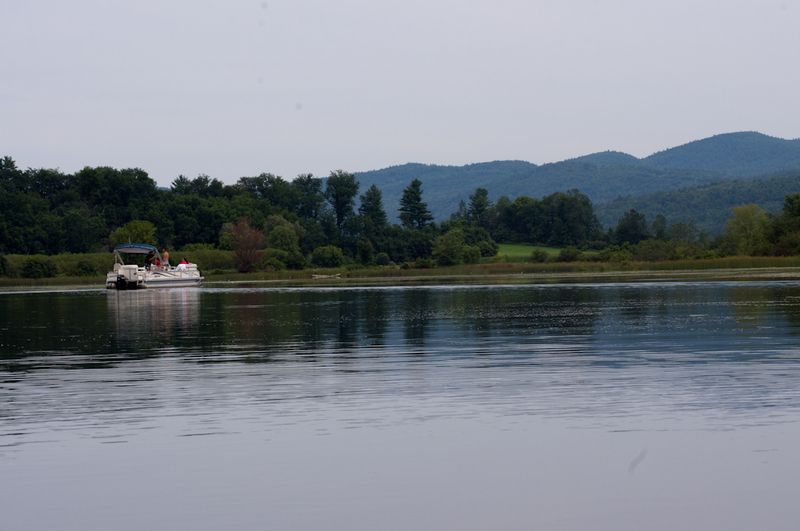 I hugged the New Hampshire shore and the “grass islands” where I had seen some ducks and a Heron during the last trip in this part of the river. Sure enough a bunch (probably not the right word) were hanging out on a log. 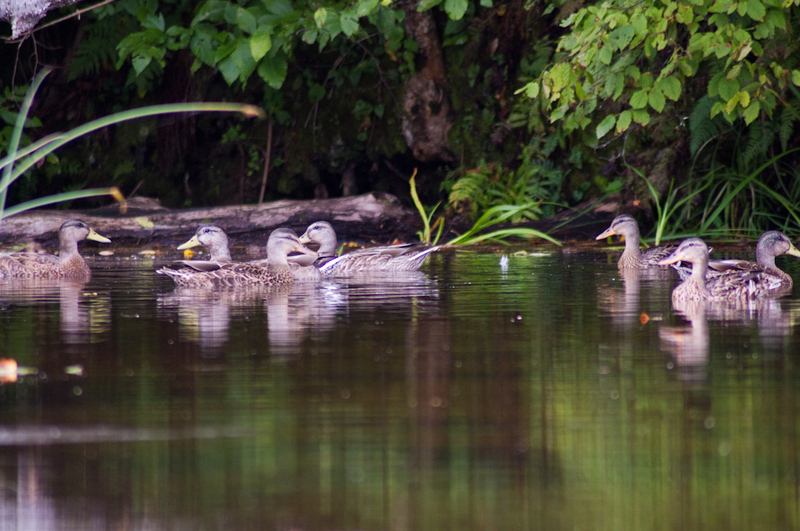 I found a small flock hanging out in a mini-cove on the New Hampshire shoreline. 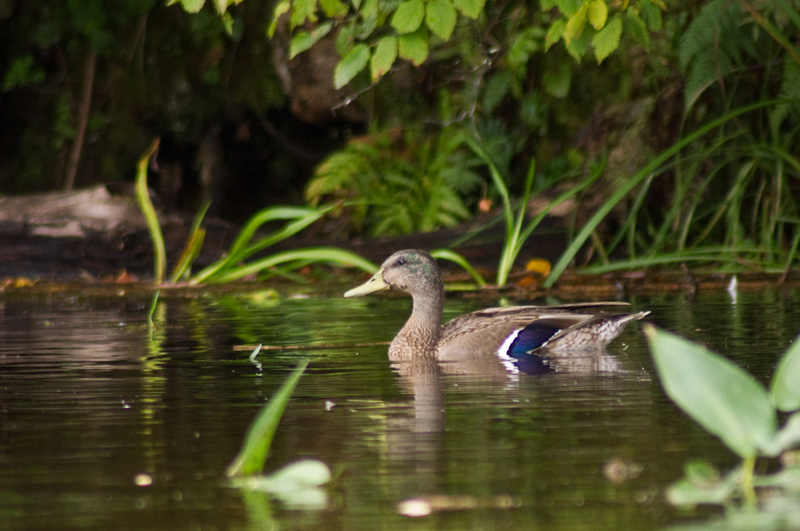 This Black Duck also has green coloring on his head feathers that reminds me of a Mallard. Looking up I could not believe my luck. 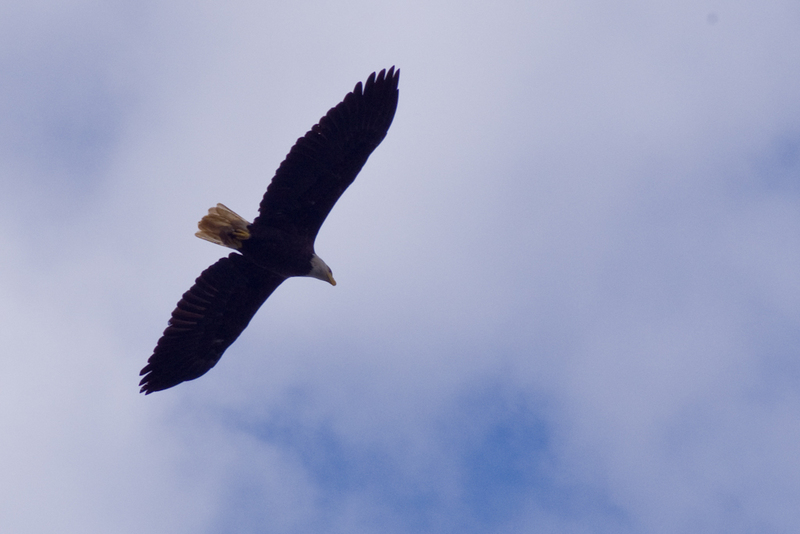 One of the area Bald Eagles was flying low (for an eagle) over the river. I suspect that this is one of the birds that lives below the Wilder Dam. 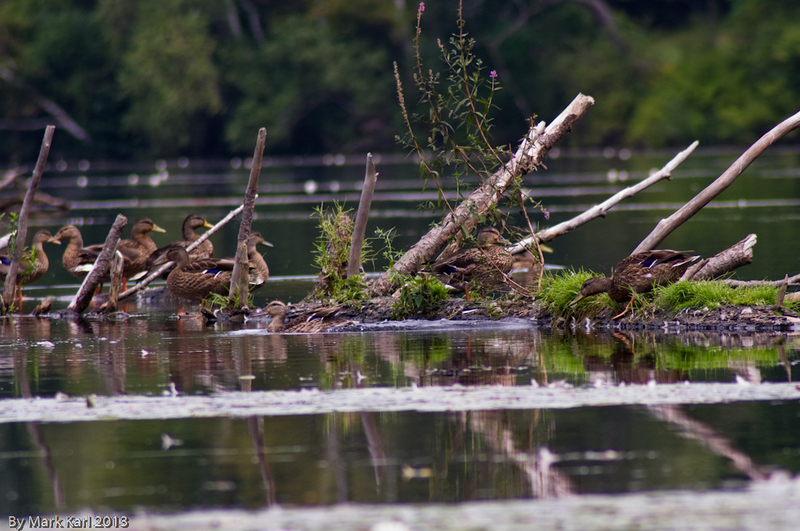 At the tip of the largest “grass island” I found the whole flock of ducks all lined up on a log. 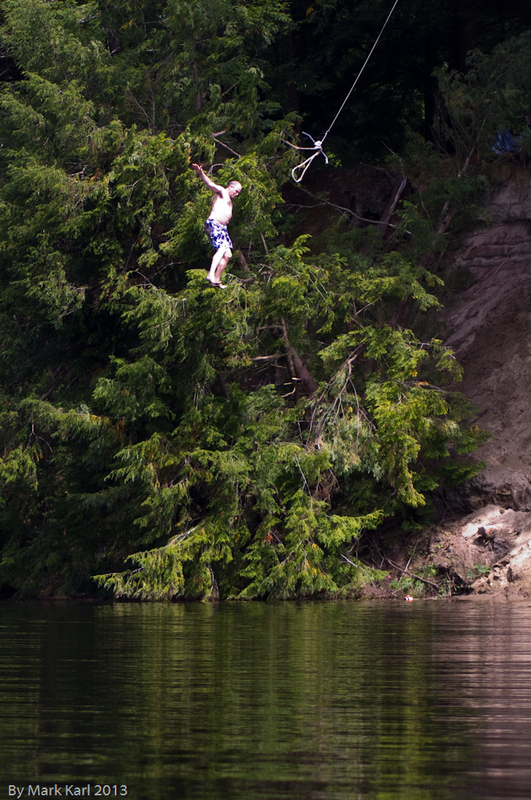 While going around the big island (not sure what the name is) I noticed some people on the river bank having fun on a rope swing. I headed north once more. The water was like glass. I found a couple other small back-ins up river. 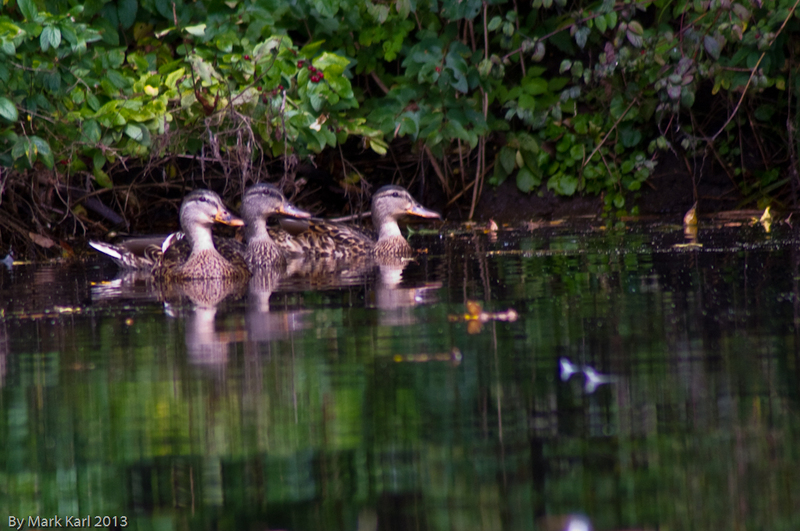 One on the Vermont side had a couple more small flocks of Black Ducks. 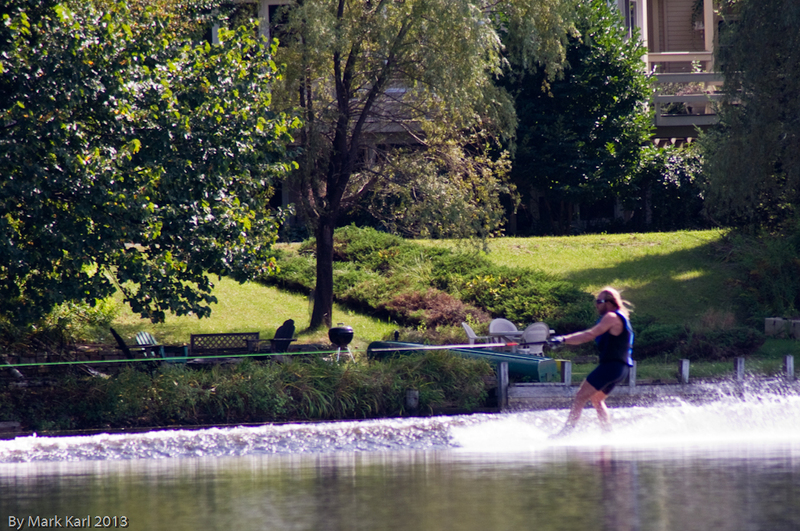 On the way south I was almost back at Wilson’s Landing when a water skier zipped by. It looks like fun. I will have to try that someday. According to the Google Maps route (at the top) I went just under 10 miles on this trip and was on the water about three and a half to four hours. 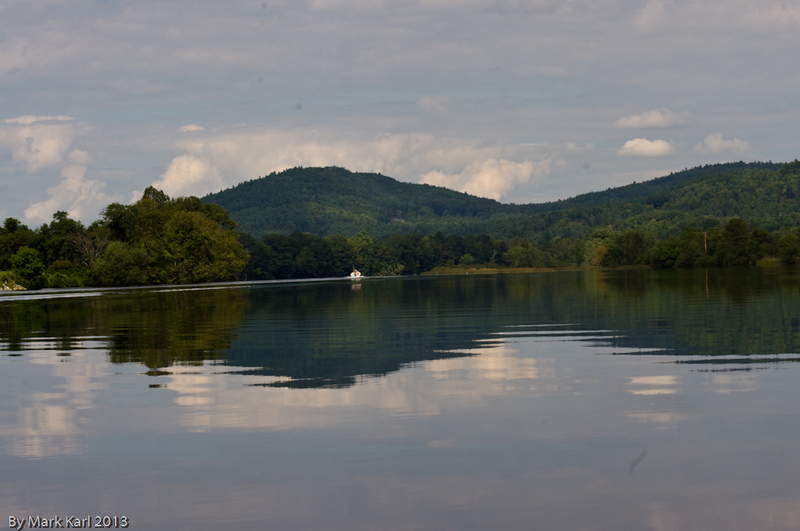 On Sunday, August 18th I went kayaking in another section of the Connecticut River. 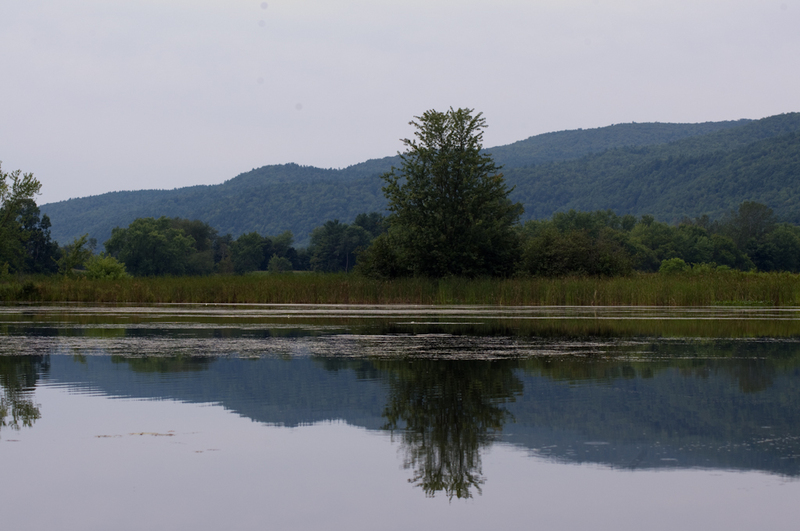 This time I put in at the Orford, NH boat landing and headed south towards Reeds Marsh and another back-in (that I don’t know the name of). Reeds Marsh kind of has two sections. One part you can get to from Route 10 in Orford, NH. It used to be a great spot to catch Hornpout but the weeds have grown in so thick it is difficult to fish here. 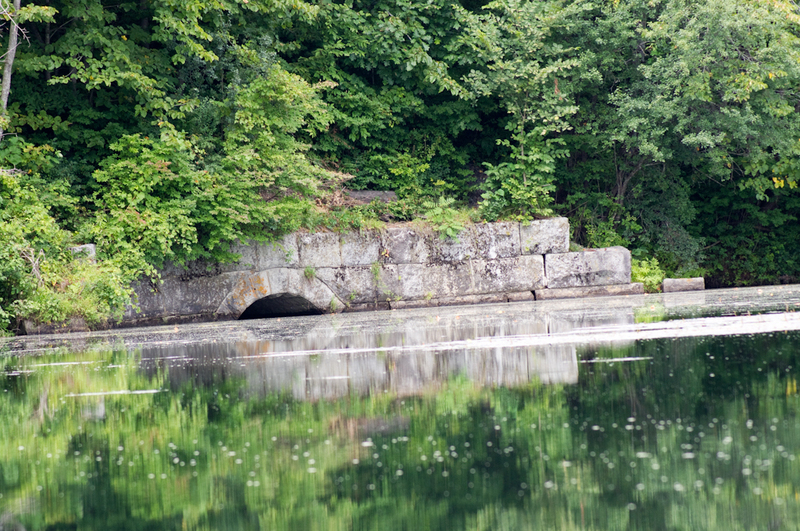 The other part is a large “pool” that you can enter through a narrow channel from the Connecticut River. 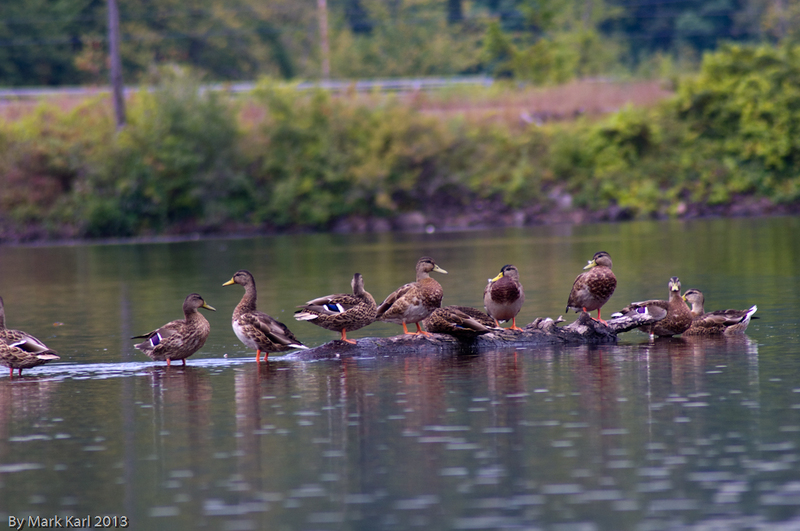 I noticed several small flocks of Black Ducks upon entering the “pool” on the river side. 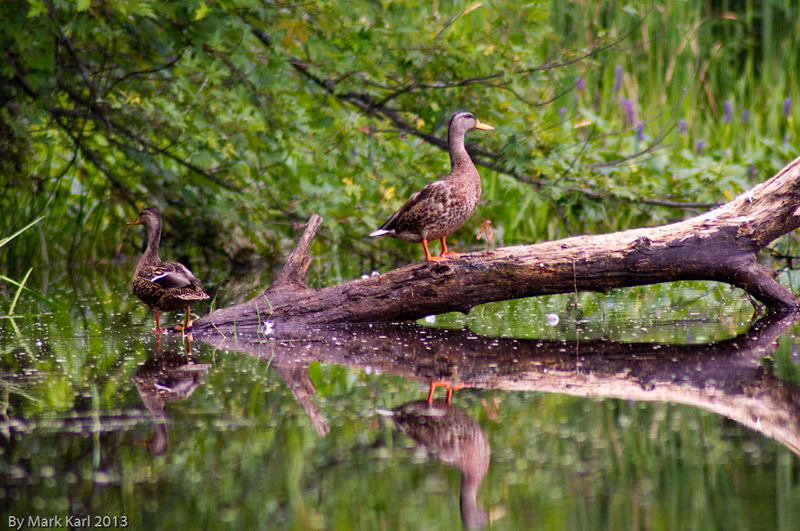 In a back corner I found these ducks hanging out on a log. 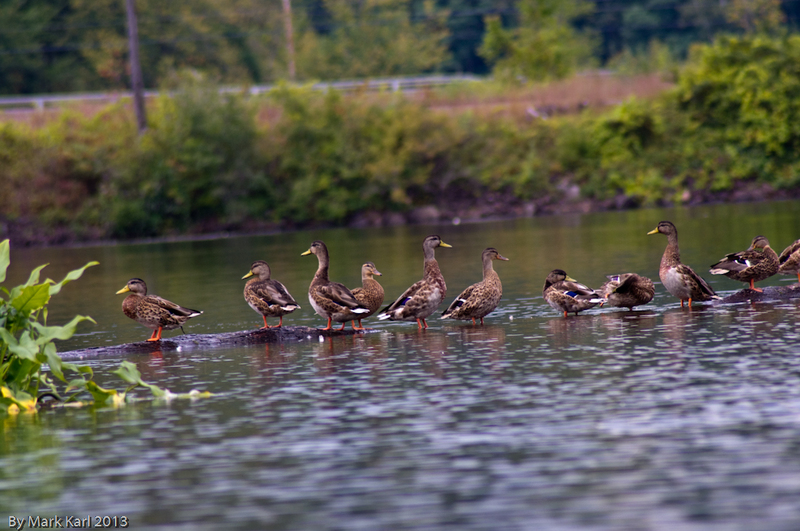 I noticed far fewer ducks on this section of the river compared to the Wilder, VT and Hanover, NH area. They are a lot more wary of people as well. I continued on down river towards the large back-in on the Fairlee side of the river. I have no idea what it is named but I have been fishing there, in the summer and through the ice for years. 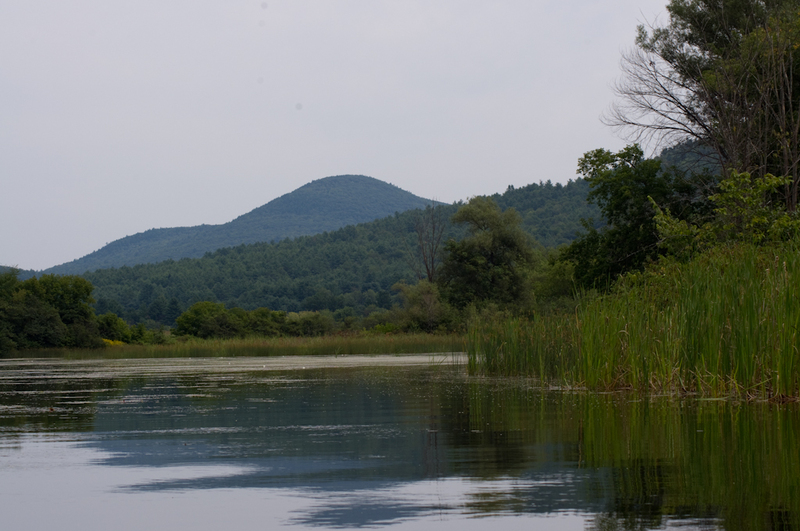 It is known as a great place for Northern Pike in the winter. I believe this is where the outflow from Lake Morey flows into the Connecticut River. However there is a culvert pipe going under the railroad tracks preventing you from going too far upstream. 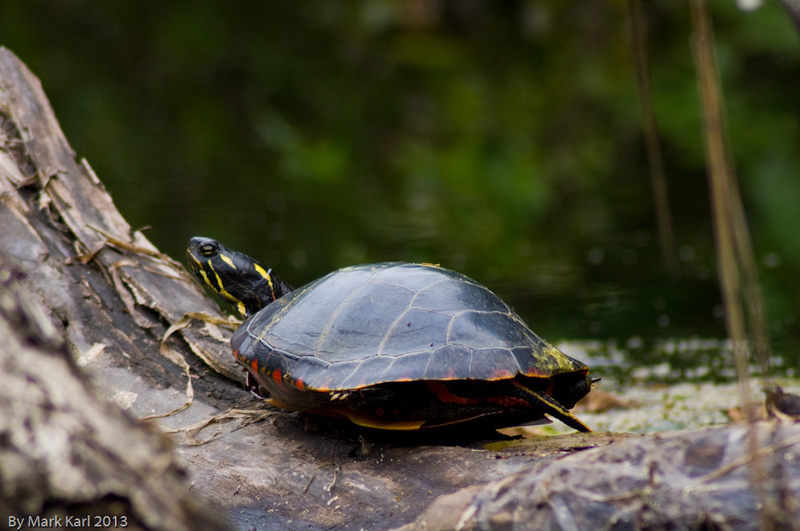 I did manage to sneak up on this Painted Turtle while paddling to the back corner of the back-in. 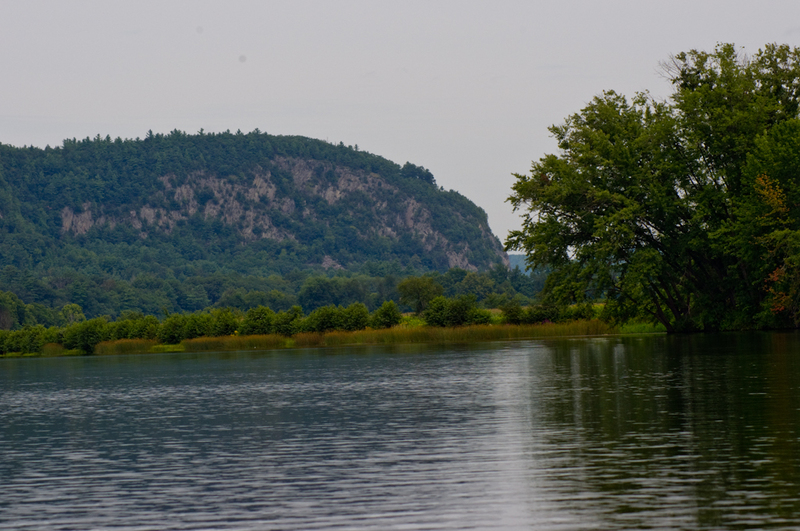 On the way back to Orford, NH I got a nice view of the Fairlee cliffs in Fairlee, VT.